After a recent incident that occurred at the Fishers Ikea, it is an appropriate time to review the laws on Criminal Recklessness in Indiana. According to an IndyStar article, a Camby, Indiana man recently visited the Ikea store in Fishers, Indiana. The man, who was carrying a loaded handgun in the pocket of his shorts, sat down on one of the couches near the entrance to the store because his back was hurting. After the man stood up to go look for his family, unbeknownst to the man, his handgun fell out of his pocket. According to the probable cause affidavit filed with the court, the man told the officers that he was wearing shorts with shallow pockets and admitted that the pockets were unsafe. The man later told officers that the handgun probably fell out when he crossed his legs. Enter Murphy’s Law – “Anything that can go wrong will go wrong.” Shortly after the man’s handgun fell out, a six-year-old boy found the gun lodged in the couch cushions and shot the gun into the couch cushion while playing with it. Thankfully, no one was injured. However, three days later the Hamilton County Prosecutor’s Office filed charges against the man for Criminal Recklessness committed with a deadly weapon, a level 6 felony. Indiana law requires a license for carrying a handgun. However, the statute does not discuss the method of carrying a handgun, so the license covers open carry of a firearm, concealed carry, vehicle carry and locked case carry. Neither the IndyStar articles nor the probable cause affidavit state whether the man had a permit to carry a handgun. 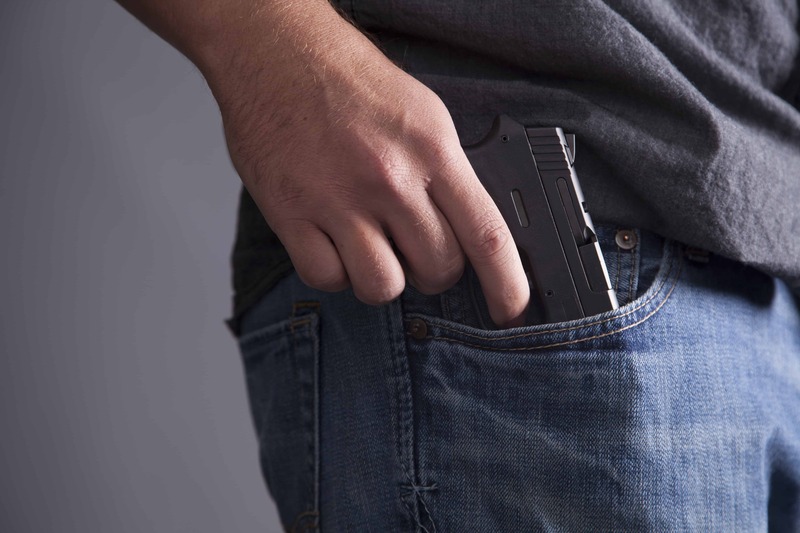 In Collier v. State, the Indiana Court of Appeals held that the element necessary for a conviction for carrying a handgun without a license does not require proof different from the elements necessary to prove criminal recklessness with a deadly weapon. Therefore, convictions for both would violate double jeopardy. But, in Woods v. State, the Indiana Court of Appeals affirmed a defendant’s convictions of criminal recklessness, a Class D felony, and for carrying a handgun without a license, a Class C felony, stating that his convictions did not violate the Double Jeopardy Clause. So as there is conflicting opinions in the Court of Appeals, it is unclear if the man had a license to carry a handgun or if the State did not charge him due to double jeopardy concerns. As you would expect in an article about a divisive topic like firearms, the comments to the Indy Star article discussing the man being charged with criminal recklessness were wide-ranging. Some felt that the man should be punished severely. Others felt that the man had made a mistake and being charged with a felony was too harsh. One person wondered what the charge would have been if someone had been killed as a result (Reckless Homicide is the likely answer, a level 5 felony). (a) A person who recklessly, knowingly, or intentionally performs an act that creates a substantial risk of bodily injury to another person commits criminal recklessness. Except as provided in subsection (b), criminal recklessness is a Class B misdemeanor. (B)the person committed aggressive driving (as defined in IC 9-21-8-55) that results in the death of another person. While this statute outlines criminal recklessness, it still doesn’t explain what “recklessly” means. For that, we’ll have to turn to Indiana case law. Most crimes have an “intent” element as part of the crime. In other words, someone intended to do something. However, Indiana courts have held that “Recklessness” is shown by a disregard for the harm that might result. So, the crime of recklessness does not require an intent to accomplish a result which would constitute a crime. Instead, where a person is charged with criminal recklessness, he is not required to intend the harm which resulted from his actions; it is sufficient to show that he realized or should have realized that there was a strong probability that such harm might result. Who decides if someone’s actions constitute Criminal Recklessness in Indiana? Indiana Courts have held that the trier of fact (the jury or judge in a bench trial) determines whether the defendant’s conduct meets the statutory definition of recklessness. Another frequent question is what is the potential jail time for a criminal recklessness conviction? The answer to that depends on how it is charged. Here are some examples of cases where Indiana Courts decided if someone’s behavior was criminally reckless. As you can see from the examples, the type of behavior that can be considered reckless varies greatly. In Dewhitt v. State, a defendant driver rammed a gate and struck a victim when he tried to leave an impound lot without paying. This evidence was sufficient for a jury to conclude that defendant, not victim, created substantial risk of bodily injury, supporting defendant’s conviction for criminal recklessness as Class D felony (level 6 now). The fact that the “weapon” element of offense was a vehicle did not require that defendant be charged instead with Class A misdemeanor of criminal recklessness involving vehicle. In Wallace v. State, a truck driver’s conduct in changing lanes without signaling and inadvertently forcing another vehicle off the road was negligent at most, not criminally reckless. In Upp v. State, evidence that a defendant fired gunshots into the ground, close to the victim, created a substantial risk that the victim could have been hit. There was also evidence that at the time in question the defendant was the aggressor was this was sufficient to sustain a conviction for criminal recklessness. In Beach v. State, Evidence that a defendant drove his car on the sidewalk in front of a home at approximately 30 to 40 m.p.h., nearly striking several people, ten turned the car around, returned to the scene, and again narrowly missed someone while driving upon the sidewalk was sufficient to support convictions for attempted battery and criminal recklessness. In Irwin v. State, the Court of Appeals found that the evidence was sufficient to convict defendant of criminal recklessness where he served a customer 10 double drinks over a period of 130 minutes and then allowed him to leave the premises. The Court found that the Defendant had unjustifiably disregarded the harm that might result, thereby performing an act that created a substantial risk of bodily injury to the general public. In Griffith v. State, the Court found the evidence was sufficient to support defendant’s criminal recklessness as a Class D felony as the victim testified that the defendant put a gun towards the victim’s head and in the victim’s ribs. In Bruno v. State, the evidence was sufficient to support a conviction for criminal recklessness where the defendant and his friends obtained weapons and gathered near the victims’ house and where witnesses saw defendant and the friends fire weapons into the house, knowing it was occupied. In Tipton v. State, evidence that a defendant was shooting a neighbor’s home, even if the neighbor was away from home at the moment of the shooting, was sufficient for a criminal recklessness conviction because the Court found that someone shooting a gun at a residence could create a substantial risk of bodily injury to another person. In Snyder v. State, a defendant entered a room with a loaded shotgun and fired a shot into the pillow on which victim had been resting her head, with its muzzle approximately 12 inches from victim’s head. The Court of Appeals found there was more than sufficient evidence to support a criminal recklessness conviction based on these facts. In Miller v. State, the trial court found an off-duty sheriff deputy guilty of criminal recklessness. The Court of Appeals found that a person who enters a restaurant which contains employees and patrons and fires a pistol should know that such behavior is reckless and deviates from acceptable standards of conduct, especially if that person is a special deputy sheriff and is supposedly trained in the use of firearms. In Boushehry v. State, the Court of Appeals found that the possibility of a motorist passing by on the road at the time defendant’s accomplice fired a gun across a vacant lot presented only a remote risk of bodily injury. Since the State failed to prove the actual existence of a substantial risk of bodily injury to another person, defendant’s conviction for criminal recklessness was reversed. In Woods v. State, the Court of Appeals court affirmed a defendant’s conviction of criminal recklessness, a Class D felony, since a reasonable jury could have concluded that a substantial risk of bodily injury arose when defendant fired several gunshots in a residential area in close proximity to adults and children; it was not improbable that a bullet could have ricocheted and struck one of the nearby people or that a child could have ridden his or her bicycle into the line of fire. So, to convict the man whose handgun fell out of his pocket at the Fishers Ikea, the State of Indiana will have to prove, beyond a reasonable doubt, that the man keeping his handgun in pocket, which the man admitted was unsafe, created a substantial risk of bodily injury to another person. The fact that no one was injured is immaterial to deciding whether the man was criminally negligent. And, as the alleged criminally reckless conduct involved a handgun, it is charged as a felony. The man stated he did not leave his gun knowingly or intentionally. Therefore, a jury, or the judge if the man elects for a bench trial, will have to decide if the man acted recklessly pursuant to Indiana’s criminal recklessness statute. We’ll follow the case and update this post when either the man takes a plea agreement, or a verdict is reached at trial. Have additional questions about criminal recklessness in Indiana? Give us a call at 1-877-77-AVNET or or contact us below with any additional questions you may have about criminal recklessness in Indiana.